Solids show amazing range of electrical conductivities. Electrical conductivity is the reciprocal of resistivity. Whereas resistivity is the property of solids to resist flow of electricity, conductivity is the property to conduct electricity. The SI unit of resistivity is ohm meter. Since, conductivity is the reciprocal of resistivity, thus its unit is reciprocal of ohm meter, i.e. ohm-1 m-1. Conductivity is generally represented by Greek letter σ (sigma). The SI unit of conductivity is Siemens per meter, i.e. S/m. (a) Conductor: Solids having magnitude of range of conductivities from 104 to 107 ohm-1 m-1 are classified as conductors. Metals are good conductor of electricity. Silver has conductivity in the order of 107 ohm-1 m-1 is considered as very good conductor. (b) Insulator: Solids having range of conductivity from 10-20 to 10-10 ohm-1 m-1 are considered as insulators. (c) Semiconductor: Solids having intermediate range of conductivity, i.e. from 10-6 to 104 ohm-1 m-1 are called semiconductors. Metals show electrical conductivity because of movement of electrons. Electrolytes show electrical conductivity because of movement of ions. Metals show electrical conductivity in solid and molten states both while electrolytes show electrical conductivity in molten state and aqueous solution. Conductivity in metals depends upon presence of unpaired electrons in their valence shell per atom. Electrons present in valence shell of metals are free to move and allow conducting electricity in metals. Energy level (atomic orbital) with electrons and vacant energy levels present in metals have if minute difference in energy they together are called energy band or simply band. The empty energy levels or unoccupied energy levels are known as conduction band also since they helps in conduction of electricity. When partially filled energy levels (atomic orbital) are too close or overlapped with unoccupied energy level or conduction band; electrons can easily flow between them under the electrical field. Because of flows of unpaired electrons from occupied energy level to conduction band metals conduct electricity. In insulators the difference in energy between occupied energy level and unoccupied energy level (conduction band) is higher because of which electrons do not flow from occupied energy band to the next higher unoccupied energy band resulting insulators do not conduct electricity as electrons do not flow. In semiconductors like silicon and germanium, the energy gap between valence shell and conduction band is so smaller that electrons may jump from filled orbital to conduction band when put under electrical field. Because of this behavior, i.e. lower gap between valence band and conduction band semiconductor show the conduction of electricity. The conduction of electricity in semiconductors increases with increase in temperature. Elements such as silicon and germanium show such behavior and are called intrinsic semiconductors. Intrinsic semiconductors show very low conductivity and thus cannot be used practically. Thus, the conductivity of intrinsic semiconductors is increased by adding suitable impurities. Addition of appropriate amount of suitable impurities to elements, such as intrinsic semiconductors is called doping. Doping is done with electron rich or electron deficient element (impurities) to the intrinsic semiconductors. Doping with electron rich or electron deficient elements creates electronic defects in semiconductors. Silicon and/or germanium are doped with electron rich impurities to increase their electrical conductivity. Semiconductors so formed after are called n-type semiconductors. Silicon and germanium, each has four valence electrons as they belong to 14th group of periodic table. Arsenic and phosphorous belong to 15th group of periodic table and they have valence electrons equal to 5. When silicon or germanium is doped with phosphorous or arsenic, four electrons of phosphorous or arsenic out of five; make covalent bonds with four electrons of silicon or germanium leaving one electron free; which increases the electrical conductivity of silicon or germanium. 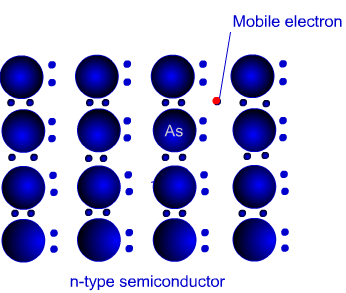 Since the electrical conductivity of silicon or phosphorous is increased because of negatively charged particle (electron), thus this is known as n-type of semiconductor. Electrical conductivity of silicon or germanium is doped with elements, such as Boron, Aluminium or Gallium which belong to group 13th in periodic table also. Elements belong to group 13th have valence electrons equal to 3. Three valence electrons present in these elements make covalent bonds with three electrons present in valence shell out of four of silicon or germanium leaving one electron delocalized. The place from where one electron is missing is called electron hole or electron vacancy. When the silicon or germanium is placed under electrical field, electron from neighbouring atom fill the electron hole, but in doing so another electron hole is created at the place of movement of electron. In the influence of electrical filed electron moves toward positively charge plate through electron hole as appearing the electron hole as positively charged and are moving towards negatively charged plate. Semiconductor formed by the doping with electron deficient impurities; are called p-type semiconductors. Both n-type and p-type semiconductors are used in making electronic components. As diode which is the combination of n-type and p-type semiconductors. Substance shows magnetic properties because of presence of electrons in them. Each electron in an atom behaves like a magnet because of its two types of motions - one is around their axis and other around the nucleus. Electrons in an atom because of charge over then and in motion continuously; possess small loop of current which shows the magnetic moment. (a) Paramagnetism: Substances which are attracted slightly by magnetic field and do not retain the magnetic property after removal of magnetic field are called paramagnetic substances. For example O2+, Cu2+, Fe3+, Cr3+, Magnesium, molybdenum, lithium, etc. Substances show paramagnetism because of presence of unpaired electrons. These unpaired electrons are attracted by magnetic field. (b) Diamagnetism: Diamagnetic substances are just opposite to that of paramagnetic. Substances which are repelled slightly by magnetic field are called diamagnetic substances. For example; H2O, NaCl, C6H6, etc. Diamangetic substances are magnetized slightly when put under magnetic field but in opposite direction. Substances show diamagnetic property because of presence of paired electrons and no unpaired electron. Thus, pairing of electrons cancel the magnetic property. (c) Ferromagnetism: Substances that are attracted strongly with magnetic field are called ferromagnetic substances, such as cobalt, nickel, iron, gadolinium, chromium oxide, etc. Ferromagnetic substances can be permanently magnetized also. Metal ions of ferromagnetic substances are randomly oriented in normal condition and substances do not act as a magnet. But when metal ions are grouped together in small regions, called domains, each domains act like a tiny magnet and produce strong magnetic field, in such condition ferromagnetic substance act like a magnet. When the ordering of domains in group persists even after removal of magnetic field a ferromagnetic substance becomes a permanent magnet. (d) Antiferromagnetism: Substances in which domain structure are similar to ferromagnetic substances but are oriented oppositely, which cancel the magnetic property are called antiferromagnetic substances and this property is called antiferromagnetism. For example; MnO. (e) Ferrimagnetism: Substances which are slightly attracted in magnetic field and in which domains are grouped in parallel and anti-parallel direction but in unequal number, are called ferromagnetic substances and this property is called ferrimagnetism. For example, magnetite (Fe3O4), ferrite (MgFe2O4), ZnFe2O4, etc. Ferrimagnetic substances lose ferrimagnetism on heating and become paramagnetic.